Using a body cap on a digital or film camera is one of the easiest and cheapest way to try out pinhole photography. You can make your own from a normal body cap and a pinhole. You can make your own pinhole with a needle and a piece of brass or aluminum, or you can buy a set of predrilled (or laser cut) pinholes. 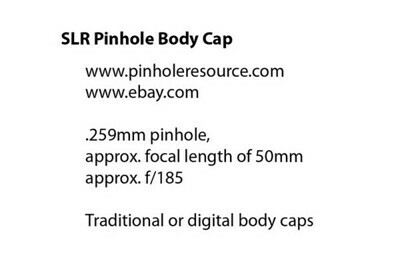 You can buy pinhole body caps online - check eBay or pinholeresource.com . You will see two types available. One is made from metal and has a hole in it. The other, sometimes called a digital pinhole, is made from a clear piece of mylar with a pinhole printed on it. This latter type is claimed to be better for digital as there is no hole through which dust can enter the camera. 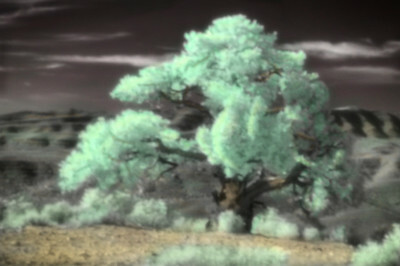 Lovell Canyon Juniper - Shot with a Nikon D300 converted for Deep IR sensitivity. Photoshop "hand coloring" was added. The camera's auto-exposure metering was used.